This manual starts where our other manual leaves off – what to do once you have a measure on the ballot. Our hope is that it will prepare you for some of the challenges you will face and give you a solid overview of the major elements of a campaign. It includes everything from day-to-day operations to overall strategy. Of course every campaign is different – but we hope this manual will help you get started thinking about what is involved. While this is not a substitute for a professional campaign consultant, it is intended to be useful to you and your team as a preliminary overview, and as a touchstone along the way. This is a large PDF. Please be patient when downloading. All of our campaigns will improve if we can learn from each other. We are eager to hear what worked and what didn’t work in your campaigns. What advice would you give to others that we can include in the next version of this guide? 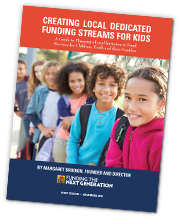 E-mail Margaret Brodkin at Margaret@fundingthenextgeneration.org. The guide is not a substitute for professional campaign consultation. If you need help finding the right campaign consultant, contact us for advice. And you can share the manual with your professional campaign consultant, once you have selected one. Hard copies are $25. Send an e-mail to margaret@fundingthenextgeneration.org if you would like to make an order.